Benefits Of Waking Up Early on Be Inspired..!! And may all your lights be green. Eugene Salomon is New Taxi driver commonly called as a cabbie, with over thirty years of driving experience on the streets of NY, or Big Apple as they call it. What sets him apart form most cabbies is that he is a native, contrary to present practice where most cabbies are immigrants from all over the world (with people from India and Pakistan making it to the list). I found this book at an outlet of Liberty Books, Karachi and bought it on instinct (after having read the title, didn’t even leaf through the pages). Well most books I buy are on instinct! And I haven’t for a page regretted buying it. This cabbie has a lot of stories to tell, and some are interesting ones, indeed. The 380 plus pager, makes an interesting read. It is full of stories that the cabbie has documented for over 30 years. 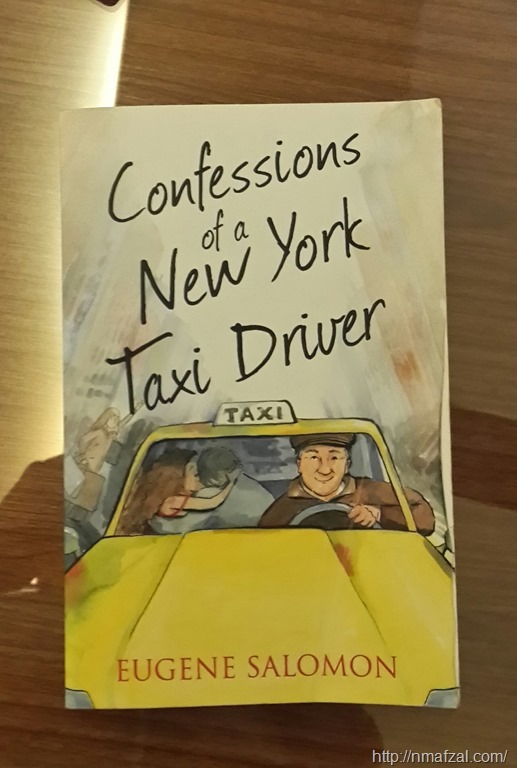 Eugene Salomon has had everyone in the back of his taxi, from stars, drunks, pimps, hookers, kissers, thugs, Mafiosi, conmen, gentlemen, common men, women of all ages and size, tourists, lovers, animals, fare dodgers and swindlers. He very interestingly classifies his passengers in to various categories, rates them according to their hailing techniques (after having successfully defined the “hail”), he writes about the traffic jams, about normal pedestrians, celebrities that he has encountered, of encountering road rage and a some amazing stories about the Karma. In every nook there is one or more “WOW moment”. It’s a term that I have coined A WOW Moment is when you read something in a book, it hits you hard (smack), you close the book, ponder over it and read it once more, or even several times. I am forced to write about a few very touching scenes from the book, aka WOW Moments. One is regarding a panhandler who approaches him and asks for money, so she can buy a drink. The reply she gets is, “sorry, but you’re only killing yourself”. To which the feeble lady replies, “I am already dead” and deftly disappears in to the night. The other is about a rich elderly couple who the cabbie transports from Madison Avenue to the 75th street and 5th Avenue (The American Aristocracy). The lady is in a wheelchair, and her man after giving a good tip to the cabbie looks at him and says, “Don’t get old”. Eugene writes, and I quote, “It said something to me I already knew but needed to be reminded of again – that if you’ve got enough food to eat and a roof over your head, you’re living in the same neighborhood as the guy on the 5th Avenue. “The human condition does not have a street address”. Unquote. WOW! Interestingly, in fact very interestingly, the author also makes a mention of a Pakistani cabbie working in Big Apple. The man who was once a doctor is now cruising on the streets of New York and is in fact making more money than he was back home! The book is written in a laid-back style and will make a fine read any day. Eugene Salomon besides driving a taxi, and now authoring a book also has his very own Blog! Titled, cabs-are-for-kissing. Well what do you expect?